ब्रिटिश राज में भारतीयों की राष्ट्रिय लोकतांत्रिक जागरूकता किन तरीको से धार्मिक क्षेत्रमें अभिव्यकत हुई? चर्चा कीजिए. First, Self Study the topic of Socio-Religious reforms from any book of your choice: Spectrum, TN Textbook Class12 Ch.5, OR Plassey to Partition. Then write the answer on a blank page with 1” margins on each side. Then, Watch my Youtube video to study the model Answer structure & list of common mistakes in this question, including benchmarks for self-assessment of your answer. During the British rule, Western education led to spread of the democratic concepts of justice, equality, openness, freedom and planted the seeds of nationalism among educated Indians. Democratic awakening that neither British Queen nor a Mughal emperor could be entrusted with the safety & welfare of Indians. Dayanand Saraswati & Derozio to Periyar: idolatry, Brahmanical rituals can’t ensure safety and welfare of devotees. On one hand, we were fighting against the misrule of the British, but till 1900s, the Sikh gurdwaras were under control of Udasi Mahants (clergymen)- many of them were accused of embezzlement & promiscuity, while they prohibited the entry of lower castes. Akali leaders fought to have Gurdwara management to democratically elected committees and allow entry for all Sikhs in the shrine. Democracy: Tolerance, Openness to new ideas, Listening to opposing ideas, Freedom of Press. Emperor Akbar practiced religious tolerance but by 18th century, religious intolerance, ignorance and irrationalism had crept in Islam. Purdah, polygamy and easy divorce were justified through mis-quoting the religious text. Sir Syed Ahmad Khan started Aligarh movement to promote rationalism & liberal ideas among Muslims through Western Education at Mohammadan Anglo Oriental College. On one hand, Indians were fighting for entry in higher civil services & legislature. On the other hand, Scheduled castes were prevented from entering in Temples. Thus, while we fought to against the ‘racial supremacy of the white men’, our own society was in the shackles of Brahmanical supremacy. Jyotiba Phule, Periyar E.V.Ramaswamy Gandhi, Dr. Ambedkar and others fought to achieve equality for the downtrodden. Widowed males were allowed to re-marry but widowed ladies were prohibited from remarrying, by mis-quoting religious texts. Sati system, child marriage & female infanticide were also justified in similar fashion. Raja Rammohan Roy, Maharishi Debendranath Tagore, Kesab Chandra Sen, Dayanand Saraswati and Pandit Ishwar Chandra Vidyasagar et.al. fought against these evils. Justice Ranade was both the member of INC and Prathna Samaj. He fought for social reforms like inter-dining, inter-caste-marriage, widow remarriage and uplift of women and depressed classes. Gandhian movement: Prabhat feri- religious songs, and nationalist songs. “Vaishnava Jan toh…” : Devotee of Vishnu respects women, understands the pain of others. Thus, our founding fathers fought for justice, freedom and equality for all in both the political and religious domains. The same spirit was also included in our Constitution under the preamble, fundamental rights, duties and directive principles. Unfortunately, the same Syed Ahmad Khan, in his later years, encouraged the Indian Muslims not to join the National Movement. Hindu Mahasabha & Muslim league distanced themselves from INC.
0: if linked democratic awakening with the 1857 mutiny. 1: if negative conclusion. Give 2 marks to yourself, if positive conclusion. Not more than 1 mark: If hardly 2-3 reformers mentioned. Not more than 2 marks: if your answer is centred around women and SC related issues only, without touching Muslim and Sikh reforms. (-1) if linking how greased bullets and Ganesh Puja were used for evoking nationalism among Indians. That’s true but it shows how religion used for nationalism, here you’re asked to link how democratic awakening linked to religious reforms. 0: if linear narration of individual reform vs movement given. +1: if attempt made to link democratic elements with religious reforms, as shown in above model answer. (-1) if long explanation of how Mahants misused funds and powers in Gurudwarah. OR longwinded biography given about individual reformer. (-1) if appearing in vernacular medium, and yet used English terms such as “चाइल्ड मेरेज, कंजरवेटिव, रिफोर्म, मूवमेंट”, instead of writing their proper translations. Don’t give yourself more than 4 marks: if introduction starts with 1857, body centred mostly around Rammohan Roy, women and SC; and democratic elements not linked. 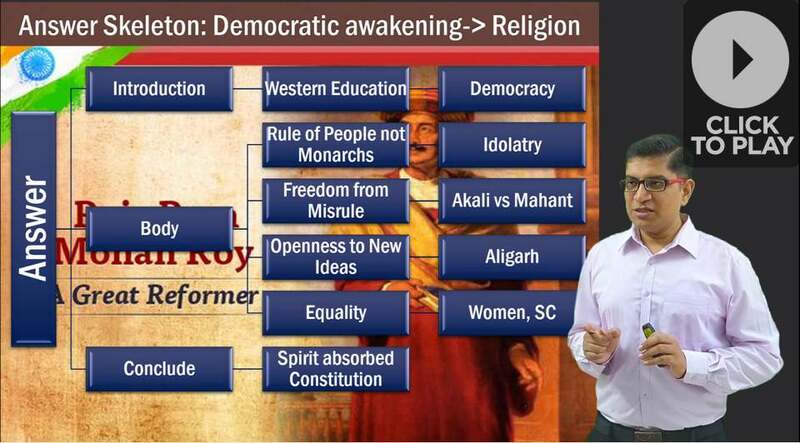 Give yourself upto 8 marks: if proper introduction and conclusion, with logical structuring of democratic awakening motivated religious reforms, sprinkled with factual masala of various reformers and organizations. Subscribe to Youtube.com/c/TheMrunalPatel for more videos on UPSC. Visit Mrunal.org/Mains for more on the Art of Answer-Writing. Sir do a question on Indian diaspora… diaspora ka qsn dharashahi kr deta h.
Sir, is there any way that I can share my answer for you evaluation for initial days till I get confidence! It would be a great help. I am needy for the right guidance and the best subject matter for the examination of PCS ( J ) of Uttar Pradesh. Because of I am a new aspirant in this field this is why I have no idea and any resource for a better preparation . And it will be my first attempt also . So , my humble question is very simple that , can you help me any type of in hindi language , SIR ?